Heat oven to 350°F. Grease 2-cup casserole or small loaf dish. Cook spinach as directed on package. 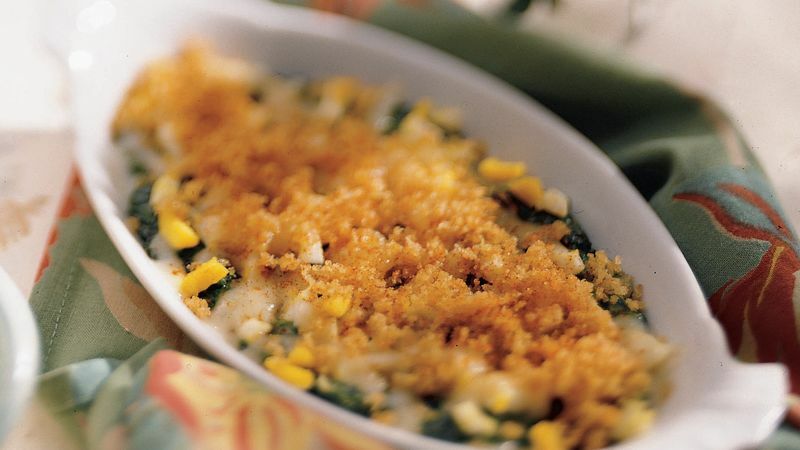 Spoon spinach into greased casserole; top with eggs and cheese. In small bowl, combine bread crumbs and margarine; mix well. Sprinkle over spinach mixture; sprinkle with paprika. Bake at 350°F. for 15 to 20 minutes or until casserole is bubbly and topping is light golden brown. Hard-cooked eggs sometimes are available in the deli or dairy section of your supermarket. Spinach is a rich source of vitamins A and C.
This casserole can be served as a meatless main dish or as a side dish for chicken or ham.